Norwex opening in Germany, Ireland, and the UK, among a growing number of European countries. What an incredible opportunity! Ask about the Norwex Global Referral Program. We are so excited for our friends in Germany, Ireland, and the UK to have Norwex opening there!! What an incredible opportunity!!! Over these past ~15 years, Norwex has been welcomed into homes all across North America with huge gratitude for bringing a better, safer way to clean! Norwex provides amazing alternatives to toxic cleaners and personal care products. What I have loved is that even those who maybe aren’t too concerned about the impact of chemicals and the toxic load in their homes and our environment, still LOVE these products because they WORK better! And they save us TIME and MONEY (and SPACE under the kitchen sink, too!)! I am a Global Sponsor for individuals wanting to start a Norwex business in Germany, Ireland, the United Kingdom, New Zealand, Australia, and our future Norwex countries! If YOU know someone in one of these countries who is looking for a ground-floor, proven business, I would be very honored to help them get started! As a Norwex Global Sponsor, these consultants can come to me for additional support as they grow their business. 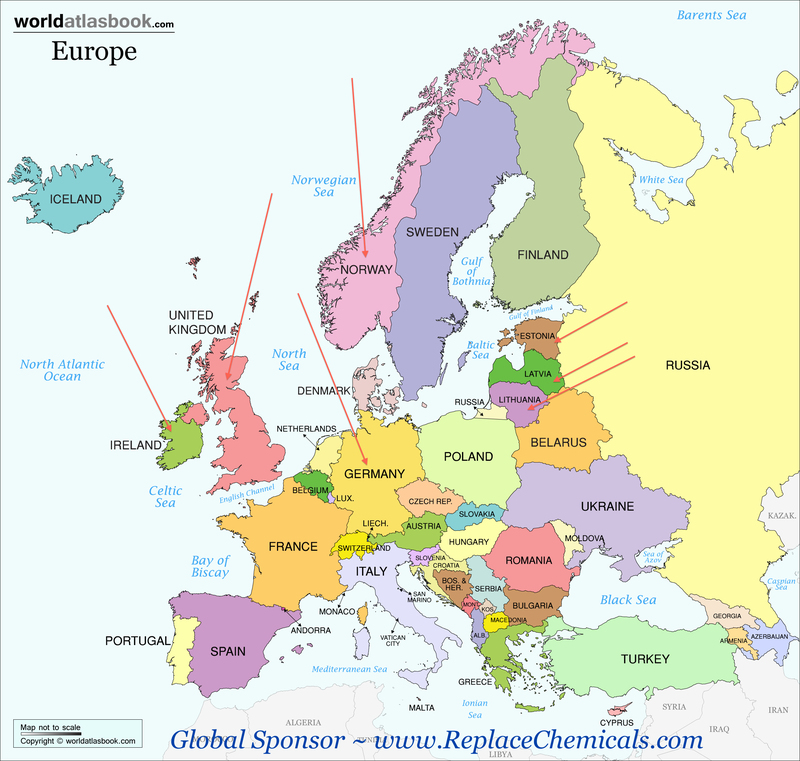 If you would like to refer someone (or yourself), please send me an email at ReplaceChemicals @ gmail . com. 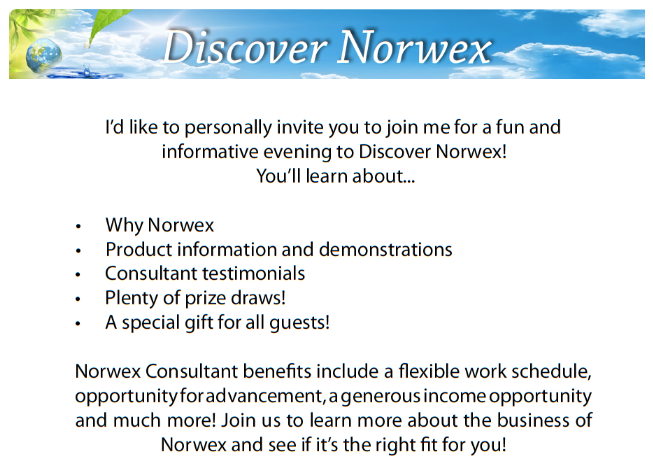 I can share more about the Global Norwex Referral Program. I am excited for this opportunity ahead for Europe! Over my past 6 years as a Norwex consultant, I’ve occasionally heard this question. “Why does Norwex make their cloths in China?”. Simply put, China offers the highest textile expertise in the world, which is necessary for our extremely high technology and quality of our cloths! So what an incredible honor that In June, as one of the Senior Vice President Norwex Leaders, I was invited to personally GO to China to visit our factory!! What a privilege, and it confirmed to me that China is the right place for these amazing cloths to be made! As we arrived in Shang Hai, we could have easily been in any North American city… except there was both English and Chinese writing on all the signs. The people around us were friendly, and we had a very warm welcome! After the long flight, we were excited to be on ground, and it seemed surreal that we were half-way around the world! 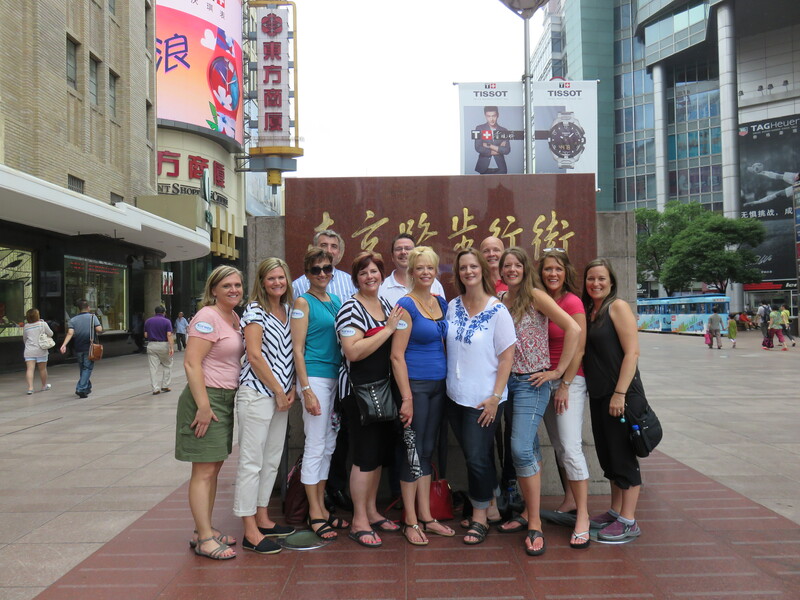 We enjoyed touring Shang Hai and learning more about the local culture, and we were all giddy about getting to finally visit the Norwex factory *in person*! We could not possibly impact and bless homes all across North America (and beyond) if it were not for our incredible production team! It was such a privilege to spend time with Norwex Global CEO, Eivind Schakt; Global Chief Sales Officer, Debbie Bolton; CEO of Norwex Canada, Judy Letain; Regional Sales Manager, Brian Dill; Chief Product Officer, David Peeters; and the factory managers and staff. Once again, confirming that Norwex has the right people in the right positions to support incredible long-term success & growth!! What an incredible, heart-centered, mission-driven company to be a part of! At the factory, we were welcomed by the staff, into an air-conditioned, immaculate entrance. When they told us that we were going to ‘make a cloth’, I didn’t know quite what to expect, but it was a memory to cherish! At the factory, we watched each and every cloth being thoroughly inspected, hand-sewn, sealed, and checked again. The love that goes into each one made me appreciate these cloths even more! The staff were as excited to see us, as we were them, knowing that neither of our jobs would be possible if it were not for the other. I couldn’t believe they were going to trust us to sew on those fancy machines. But they did!!! They gave us a sewing lesson on our practice cloth and then we got to make our “real” one!!! It was with great pride that I sewed on that Norwex tag! Once we had tried our hand at making a cloth, it was with even more appreciation we watched them all do it perfectly and with ease! My very own framed pink Enviro cloth that *I* made! Wow!!! Thank you Norwex for giving this very special gift!!! 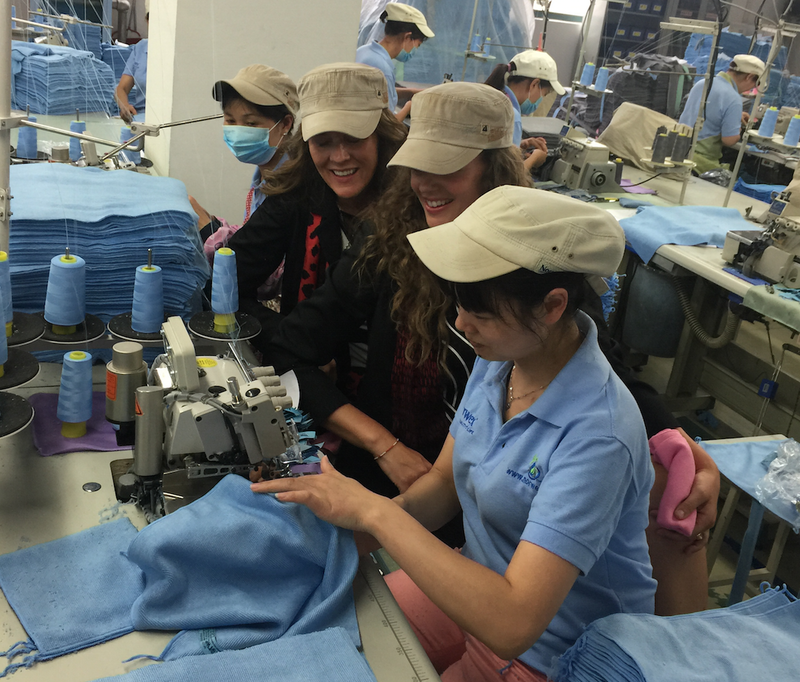 I have only scratched the surface on our trip, but what I can tell you is that Norwex is making a difference GLOBALLY… blessing their staff in China, our Global Headquarters, Dallas, TX, Canadian HQ in Dauphin, Manitoba, and all around the world. 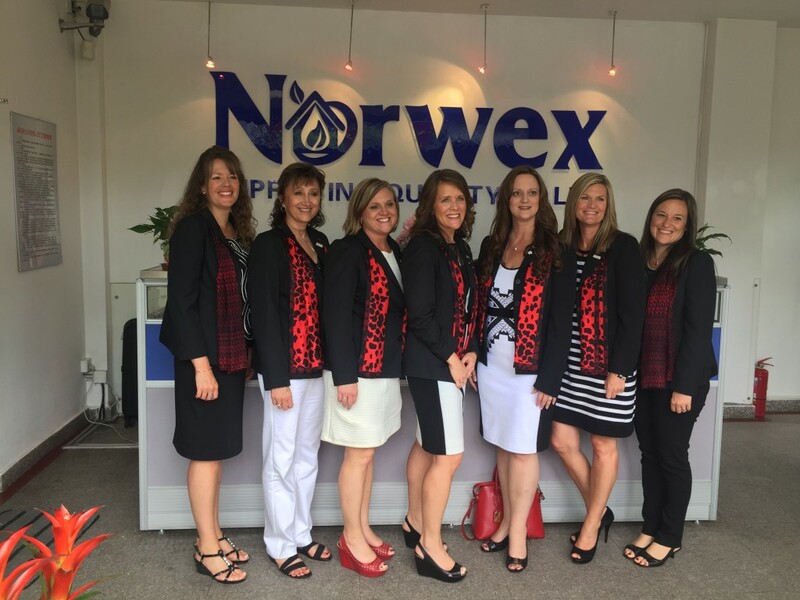 Norwex is bringing thousands of jobs to North America, where consultants have the privilege to share this ‘new way to clean’! I’m so blessed to represent this company and these products! Thank YOU for helping us introduce these Norwex products into more and more home, helping create safe havens all across North America, and beyond!!! Would you like to join us in this Norwex movement? We would love your help in sharing these products! Click here for more details about becoming a Norwex consultant! We are looking for leaders who would love to be part of something BIGGER than themselves. A mission combined perfectly with incredible opportunity for growth and income! Help us DETOX Homes across our nation!! Are you ready to DETOX your HOME? If you’re new to Norwex, take a few minutes to watch this video outlining some of our key products to get you started! And don’t hesitate to call or email with questions! Thinking of starting 2014 with a business that can make a difference in your finances this year? Norwex has been an incredible blessing to our family… and I’d love to share that same opportunity with you and your family! Ready to “Norwex Your Home”? You can shop right online at www.SonyaEckel.norwex.biz, or call me so I can help you customize your order to your specific needs! One thing I know… you’ll be SO glad you switched to Norwex!! Prepare to fall in love!! 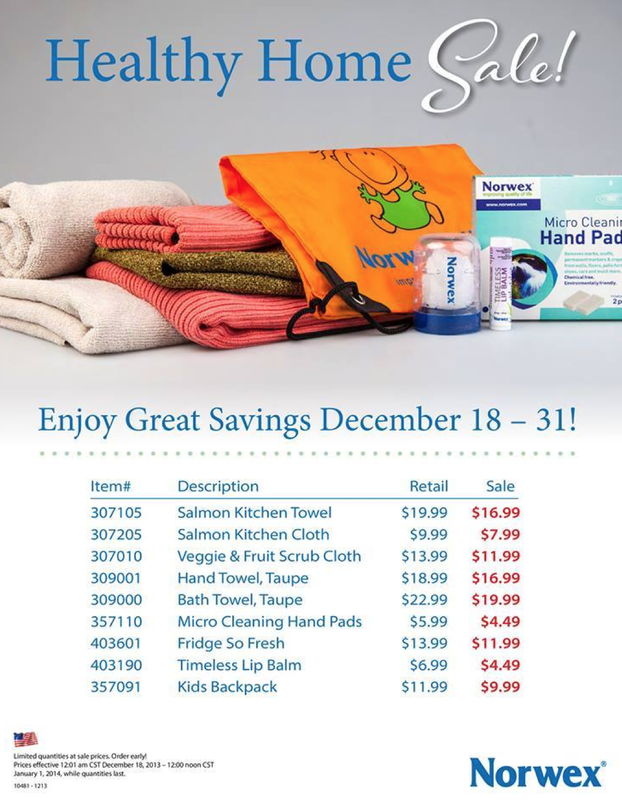 Last Day for End-of-Year Norwex Sale! Let’s make 2014 an amazing year!! On October 4th, starting at 7 pm, we will be having a “Discovering Your Norwex” meeting here in Sioux Falls, SD! These meetings are jam-packed with great info about becoming a Norwex consultant and getting your business off to a great start! I’d love to have you join me as my guest. Want to discover more about Norwex? Join me as my guest. Call me so I can get you registered as my guest, and give you all the location details, etc! I’m very honored to help with your Norwex needs, whether it be ordering some Norwex products (I ship orders throughout the US & Canada), scheduling your own Norwex show, learning more about how to become a Norwex consultant yourself… or just simply a Norwex question! I do Norwex parties throughout South Dakota, as well as the surrounding Iowa, Minnesota, & Nebraska area, and train & support new consultants all across the US. Email or phone me if I can be of assistance. Live Green. Save Green. Earn Green. New Norwex Bath Towel Colors!! And they are also still available in the standard beige color. I love the NEW Vintage Body Pack colors, too! 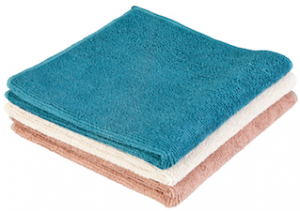 For those of you who have not yet discovered the amazing antibac* Norwex towels, call to order today! Once you’ve switched over, you’ll not go back. I love stepping out on our Bath Mat (it quickly absorbs any dampness from my feet), wrapping up my hair in the Large Bath Towel, and using the XL as a body wrap. The hair turban is also a customer favorite for dramatically reducing dry time for your hair (and no more drips!)! Purchase your Norwex here! Check out our new Fall 2012 Specialty Bundle offers on page 8 of our New Fall Catalog!! *This graphic is noted throughout the blog to differentiate those products that contain an antibacterial agent for self-cleansing purposes only. The agent is solely designed to inhibit bacterial odor, mold, and/or mildew growth within the product. Are you ready for a career that you’re passionate about? Wow- we just returned from a fantastic Norwex leader conference! 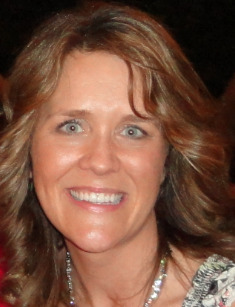 Norwex provided great training, even more fabulous business tools & a networking opportunity with other top leaders . We know that Norwex offers our customers life-changing products that help protect our health & our planet, with a great guarantee & excellent customer service! And we know that Norwex treats their hosts & hostesses like kings & queens! My hostesses are continually amazed by all of the FREE product they earned as a thank you for sharing Norwex with their friends! And from a consultant’s standpoint, I’m continually AMAZED by this company’s integrity, care & generosity toward those who represent Norwex! Are you looking to do something that you’re passionate about? Would you like to truly make a difference in the lives of others (as well as your own)? 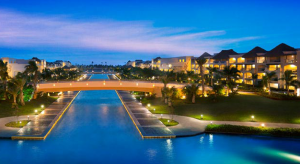 And… our next trip incentive is to the GORGEOUS Hard Rock resort in Punta Cana, Dominican Republic!! (Just take a look here: www.hardrockhotelpuntacana.com!!) And these trips are totally attainable. Before I began Norwex, I always figured that earning top-of-the-line trips like this was for “other people”… but guess what!? I have earned 3 trips from Norwex already!! We’re excited for our next incentive cruise to set sail in March… and next January, we’ll be enjoying beautiful Punta Cana! Now I know that if you’re just looking at a Norwex business for the first time, this is going to sound a bit overwhelming! I know that I didn’t understand the way everything in the compensation plan worked right away… but fortunately, that didn’t keep me from receiving my checks! And those checks have been such a blessing to our family… and they allow us to bless others. So remember, you certainly don’t need to know it all to get started!! 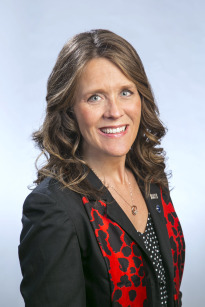 I’m extremely honored to be named the Top Leader in Norwex at Leadership Conference 2012! We are building a legacy that will positively impact many generations to come. I’ve been so fortunate to work alongside an amazing team of like-minded men & women. We provide top-level training to our team, and I offer my personal phone & email support to those who choose me as their Norwex sponsor & mentor. I look forward to helping YOU reach YOUR Norwex goals! You can use it by breathing on your glasses and wiping, or with glasses spray. Some customers even like to use it dry, although your optometrist may not agree with that, as you risk scratching your glasses with a small particle of dust! Most optometrists recommend always cleaning your glasses with some moisture. But however you choose to use it, you’ll find it leaves your glasses crystal clear! As always, if you have any questions, I’m always happy to answer them. Feel free to call or email! Today as I was looking at my coffee mug with its coffee stains, I was recalling how those stains used to be difficult to get off. So I decided to write a little note today about how we wash dishes with Norwex! Most of us have an automatic dishwasher, but if you’re like us, there are some dishes that you still choose to do by hand. The Norwex netted dish cloth is for cleaning your dishes with dish soap. (I love the Norwex Dishwashing Liquid! It’s low-sudsing (takes a bit of getting used to), and it does a GREAT job at getting dishes clean!) I guarantee that if you try to wipe your counters with this cloth you will leave puddles! It’s not intended for that purpose. It does provide great scrubbing power for washing dishes, dries quickly, and doesn’t provide germs an area to “set up house” & multiply! A very common error when using Norwex products is when our customers use our Kitchen Cloths to wash their dishes! They then tell me that their Kitchen Cloths have gotten very smelly! And how we all hate the “stinky dish cloth”! But if you’ve been to one of my Norwex parties, you already know that I educate you in using TWO separate cloths in your kitchen. One for washing dishes (the Norwex netted dish cloth) and one for wiping counters, tables, etc, using JUST WATER (either a Norwex Enviro Clothor Kitchen Cloth). Yes, this takes a bit of getting used to, but it’s very exciting to discover a “stinky-dish-cloth-solution”!! I must also mention the fantastic NorwexSpirinetts These are our amazing no-rust stainless-steel scrubbers that provide some serious & quick “elbow grease” for cleaning pots and pans!! (Spirinetts should not be used on surfaces that scratch easily, such as Teflon or porcelain though!) Not only do customers love these for cleaning pots & pans, but also for oven cleaning (AWESOME in combination with our Oven & Grill Cleaner!)! And if you’re a “sponge person”, you will likely love our Spirisponge. 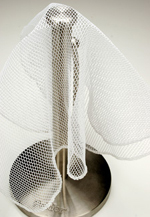 It can be washed in the top rack of your dishwasher (as can the netted dish cloth & the spirinetts). It is a more disposable item than our cloths, so you’ll occasionally need to replace it. Some people even use this sponge to scrub their flat-top stove. The Norwex Kitchen Cloths (the ones that come in green, tan & yellow) are to be used with WATER ONLY to wipe and sanitize your counters and tables. (They also serve as great little-hand “napkins” at our house!) However, as I mentioned above, IF you decide to use this antibac kitchen cloth to wash your dishes, you will find that it quickly takes on an odor!! The grease & dish soap residue will quickly coat the silver agent that’s embedded in the fibers, making it ineffective against germs. If you have done this, try soaking your cloths in concentrated Norwex Laundry Detergent overnight and then boiling them in a kettle on the stovetop for about 12 minutes. This should help them release all the soap build-up, grease, and so forth. And then begin using them properly… with just water. Here’s a helpful tip that one of my good customers passed on in regards to the Kitchen Cloths: “After each use, I scrub it (didn’t do this before, as with a regular counter cloth, I didn’t…had to change my habits), then I let it dry over the oven door handle, each time, so it does not sit wet. This way, I can go one week without a sour smell to the Norwex kitchen cloth. Before it would sour in about 3 days…love the cloths! !” So remember to scrub it well against itself under water, wring it out well, and hang it to dry! This will make for less frequent washing and boiling necessary! And remember,use them just for wiping counters and tables with JUST water! So back to my coffee stains. 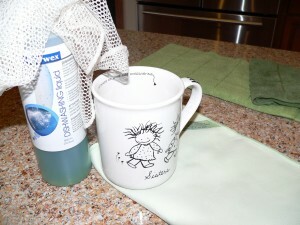 I simply took the white netted dish cloth with the Norwex dish soap and scrubbed out the cup. Then I dried it with the Norwex Suede Envirotowel (mint green). (It makes a great dish-drying towel, especially if you’re a flour-sack dish towel fan!) 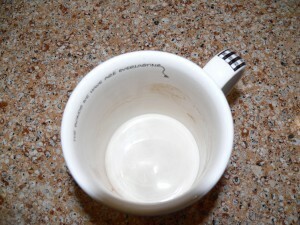 And my mug was sparkling clean and stain-free again! In the photo, you’ll see the Dish Liquid, Netted Dish Cloth & Envirotowel setting by the mug. I love Norwex kitchen towels as a “hand towel” for wiping hands in the kitchen or bath!! And I use the kitchen cloths to wipe counters (again, NOT for washing dishes!). I mentioned above how most of us have automatic dishwashers. So I’ll take a moment to talk about the Norwex Dishwasher Detergent. This one Norwex product that I get some mixed reviews on. In certain homes/ water, it seems to work beautifully and customers are thrilled with it! (I must add that most of my customers who love it also use the Norwex Magnet Ball in their dishwasher.) And some people simply aren’t so crazy about it! So it’s not a product I sell a lot of. If you’re purchasing it, you have to remember that it does not have all the chemicals that you’ll find in many other detergents, so it is a safer choice, but also may not be quite as effective as those with bleach, etc. Our Dishwasher Detergent is NOT recommended for dishwashers that have a stainless steel interior, as it may lead to discoloration of the stainless. In our previous home, we had an older dishwasher that wasn’t fantastic, but after playing around a bit with the amount of Norwex detergent I was using, I eventually found an amount (used in combination with the Magnet Ball) that did the job. And in fact, it also started to remove the yellow build-up that was all over the interior. But in our new home, we have a dishwasher with a stainless interior, so I have not been using the Norwex Dishwasher Detergent. But the Magnet Ball works great in all dishwashers!! I have found it has really decreased my water spots on my glasses and I no longer need to use Jet Dry! Wooo Hoo!! 🙂 When you use the Magnet Ball, be sure you are DECREASING the amount of detergent you are putting in! This is whether or not you’re using the Norwex Dishwasher Detergent. As always, I hope this has been helpful! Please contact me if you have any questions or would like assistance with placing an order. And if you want to help us share Norwex across the USA and help us get chemicals out of our kitchens, our homes, and our environment, while earning a very good income, I am very honored to help you start your very own Norwex business! 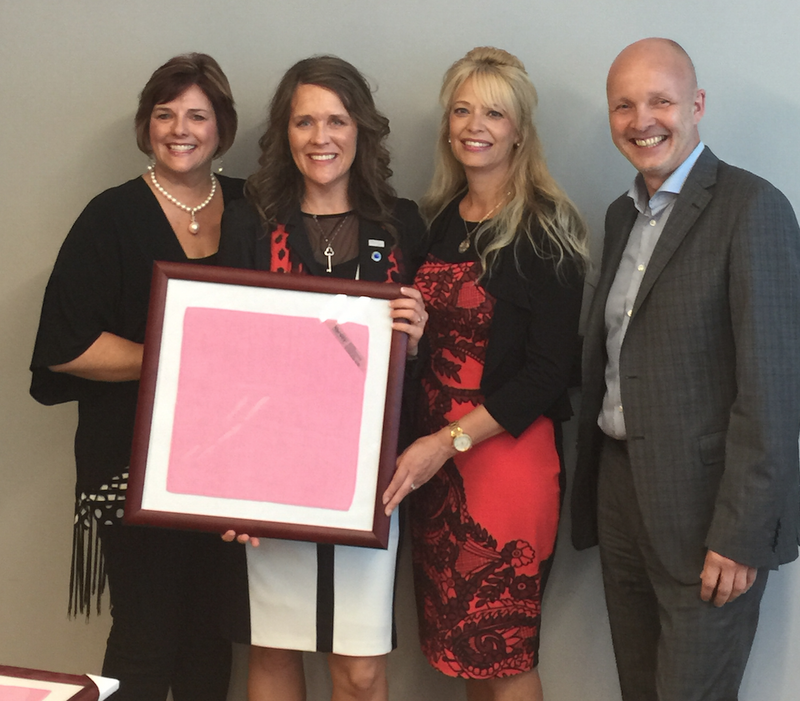 To my VP team… you are amazing! We look forward to welcoming many more into our Norwex family, as well! What an incredible mission & company to be part of. Call if you have any questions about starting your own Norwex business- we’re always happy to help you get started.